Andrew Barnard (1762-1807), the son of the Bishop of Limerick, was born in Ireland. He joined the British army in 1777 and married Lady Anne Lindsay of Balcarres (1750-1825) in 1793. As Secretary to Lord Macartney, Governor of the Cape Colony, Barnard and Lady Anne lived in the Castle of Good Hope between 1797 and 1803. Thereafter they returned to London. After the Cape was restored to Britain in 1806, Barnard again accepted an appointment there in 1807, but died shortly after his arrival. He is buried near Cape Town. Henry Dundas, Lord Melville (1742-1811) grew up in Scotland where he exercised great political power. A close friend and political ally of William Pitt the Younger and a close friend of Lady Anne Barnard, he appointed Andrew Barnard to his post as Secretary to Lord Macartney. 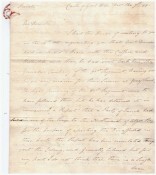 At the time of these letters, Dundas was Secretary of War. 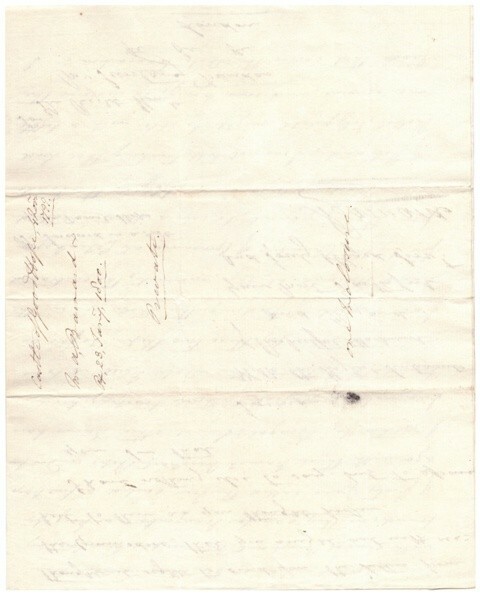 The letters are written on watermarked paper, one of which is that of "Budgen 1796". Thomas Budgen was a well-known papermaker in Dartford, Kent in the late 18th and early 19th centuries. 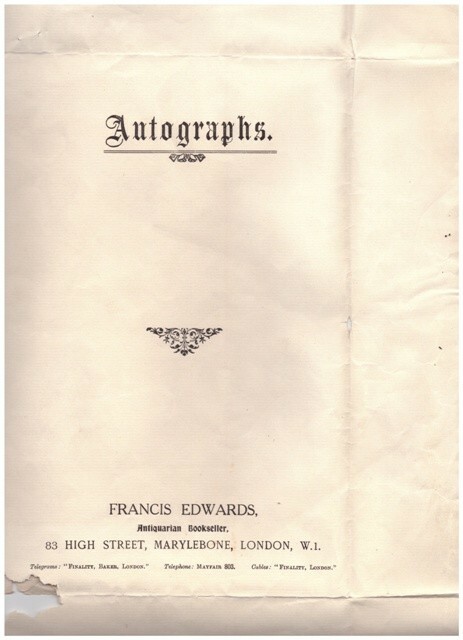 They are contained in a folder indicating they originated from Francis Edwards Antiquarian Bookseller (established in 1855) of 83 High Street, Marylebone, London, W1. One of their areas of expertise is travel, especially in Africa. The Melville Papers were disposed of in 1926 by a descendant, Sir Leicester Harmsworth, through Francis Edwards. 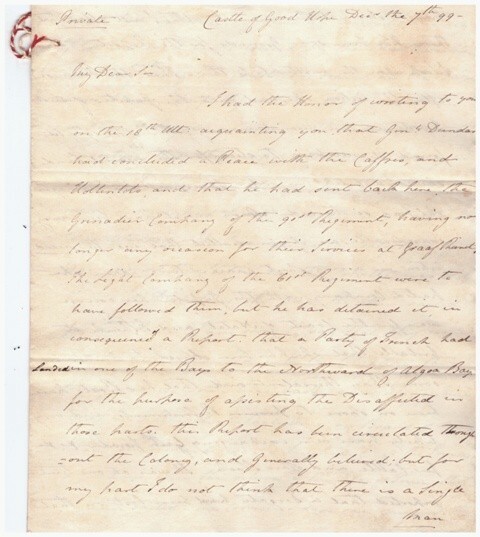 Barnard first discusses the intention of General Francis Dundas (nephew of Rt. Hon. Henry Dundas) to visit the Chief Ghyika and then return to the Cape via the Drosty of Graaff Reinet and Swarte Kops River, a trip which will see him away for a considerable time. He then discusses other letters (not present) which have been handed to him by the captain of a "Danish 64" which was protecting a Danish fleet destined for Bengal with the forty-gun frigate Iris. A further fleet of Danish ships is en route to Batavia, but did not land at the Cape. Barnard expresses his belief that the Danish ships are acting for Holland and suggests that Lord Robert Fitzgerald (England’s envoy to the Danish government in Copenhagen) might, with some management "and some money", discover the "mask" that covers the "transaction" involving the Danish fleet. This letter illustrates the fluid situation in Europe that was having an influence across the globe. The French invasion of Holland had led to the Stadtholder and some Dutch fleeing to England, whilst a number of Dutch nationals were incorporated into the French armies. The government in London was also realising that its control over the Cape, easily achieved in 1795, was now being thwarted by local inhabitants, especially those located in the eastern part of the Colony. Barnard describes how, on 4 November, the wind increased in Table Bay and occasioned an "uncommon heavy sea to roll into this Bay". At four o’clock an American Brig parted her cables and was driven ashore near the Castle. As dusk fell all the vessels in the Bay, about fifteen in number, begin to fire guns of distress. The wind continued to increase and around 8 p.m. the Royal Navy vessel Sceptre was driven ashore near Craig’s Tower and the Salt River. Shortly thereafter the Danish 64 was also driven ashore. A whaler, Sierre Leone, was then also driven ashore. Barnard provides a dramatic account of the fate of the Sceptre, mentioning members of the crew who were lost and those who were saved. Captain Edwards and his son were both lost. He also describes the types of injuries suffered, having viewed the many corpses that washed up on the beach. Sceptre was smashed up so badly that Barnard states it resembled the "smallest fire wood" on the beach. Had the gale continued Barnard concludes, all fifteen vessels in the Bay would have been lost. This storm is well documented. Malcolm Turner's SHIPWRECKS & SALVAGE (p. 124) indicates that the Sceptre, Anubis (USA), Hannah (USA), Oldenberg (Danish) and Sierre Leone were all lost. These events are described in much detail in THE CAPE DIARIES OF LADY ANNE BARNARD (vol. 1, pages 319-32). She describes how the waves "rolld in deep and Heavy" and as evening falls and wind increases "Mr Barnard, Col Craufurd & Mr Fair" go out along the shore to try and help, and they oversee the building of fires along the beach to assist the mariners in distress. Lady Anne wrote that the next morning the sea was like a mirror, but it was too late for the lost seamen. She was only allowed along the beach several days later as so many bodies needed to be taken away for burial. She particularly lamented the loss of the young son of Captain Edwards and noted that a Bible was found in his pocket. She wondered if his mother would have liked to be given that "sainted relic" but concluded that it would be "better for the mind to be without than to possess" (p. 323). Barnard initially refers to his "melancholy" letter of the 6th (see above), recording the results of the terrible gale that hit Table Bay. He indicates that the bodies of 230 of the ship's company have been found on shore, but not that of Sceptre's Captain Edwards. Barnard records that peace with the local people in the Eastern Cape had been concluded and that as a result, the 91st Regiment (Grenadier Guards) were returning to Cape Town. These events are well documented in many books. The collapse of the VOC hegemony saw factions fighting each other. Adrian van Jaarsveld and his fellow Boers, Klaas Stuurman and the Gqunukhwebe, were all contesting the area. Macartney’s diplomatic background had helped him maintain a semblance of peace, but his move back to England and the ascendancy of General Francis Dundas saw a more bellicose policy implemented with tragic results. Barnard indicates to Dundas that he has sent "twenty-four pints of excellent stein wine from Constantia" and "old Pontac" from the same place with the returning Governor, Lord Macartney. He hopes that if they "please you", Dundas will "lay your commands on me to send you some from hence". 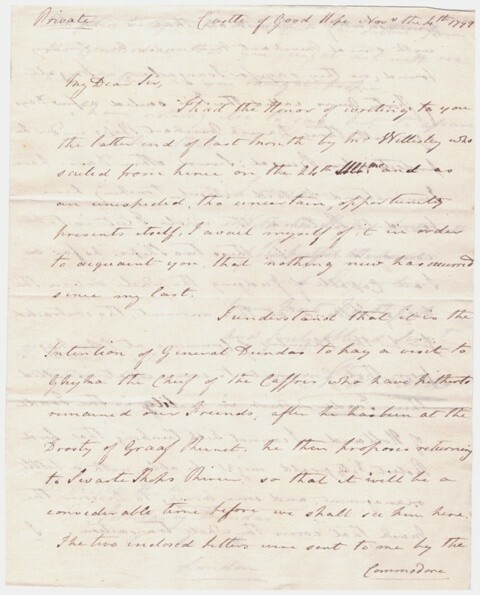 Macartney was returning to England on account of his health and whilst Barnard felt he should remain longer at the Cape because of the warmer weather, Macartney wished to return home for "surgical assistance". Barnard expresses his gratitude for the manner in which Lord Macartney has treated him ever since he was placed under his command, indicating that their relationship has been more like that of a father and son. Macartney’s last days at the Cape were spent with the Barnards in the Castle and he, Barnard felt, was accordingly enjoying "better spirits than he has had for some time." Pontac red wine was produced with success in Constantia for many years. The Barnards were to find that those who ruled the Cape after Macartney's departure were not as amenable. Both General Dundas and Sir George Yonge were to cause the Barnards distress. 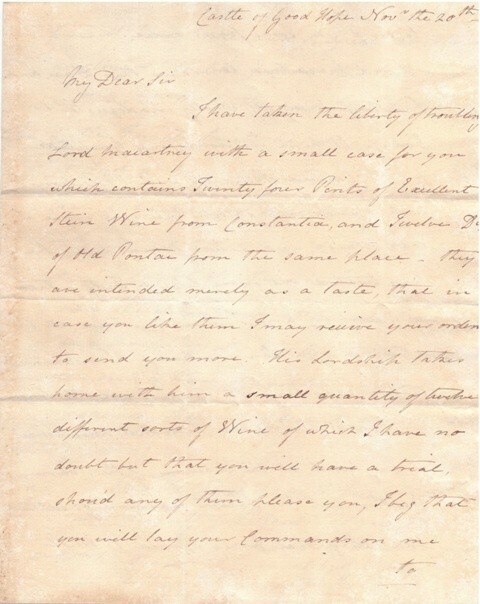 In this letter Barnard conveyed some alarming news to the Secretary of War, Henry Dundas. The Grenadier Guards had been sent back to Cape Town, but the 61st Regiment had been kept in the Eastern Cape upon a report that a French vessel had landed to the north of Algoa Bay for the "purpose of assisting the Disaffected in those parts". (p. 1) Barnard then alludes to a battle that took place in Algoa Bay between "HMS Jupiter" [vessel incorrectly named by Barnard- see note below] and another that initially flew a Danish flag before hauling up the Tricolour and revealing itself as the Preneuse. This battle resulted in damage to the French vessel and it made its way northwards out of Algoa Bay. Barnard suspected that the sighting referred to was of this vessel "being obliged to anchor in some Bay thereabouts and that her boats have been ashore..." (p. 2). HMS Rattlesnake had been despatched northwards in pursuit of the French vessel. Barnard was incorrect about the vessels that took part in the battle in Algoa Bay. In fact, it was HMS Rattlesnake (under Captain S. Gooch) and HMS Camel (Captain John Lee) on the one side; and the Preneuse (Captain L'Hermite) on the other. On the night of 20 September 1799 a rowing guard from HMS Rattlesnake came up close to an unidentified vessel flying a Danish ensign. They saw men on board with cutlasses and sounded the alarm! Two Royal Navy ships came under fire and a considerable battle took place. It was so close to shore that British troops stationed there deployed three nine-pounders which fired ineffectually at the French vessel, which, possibly alarmed by being attacked on all sides, sailed away northwards and was later sunk off Mauritius. HMS Camel was badly damaged, and HMS Rattlesnake suffered the loss of several sailors. Guns were never again fired from the fortifications on the edge of Algoa Bay. 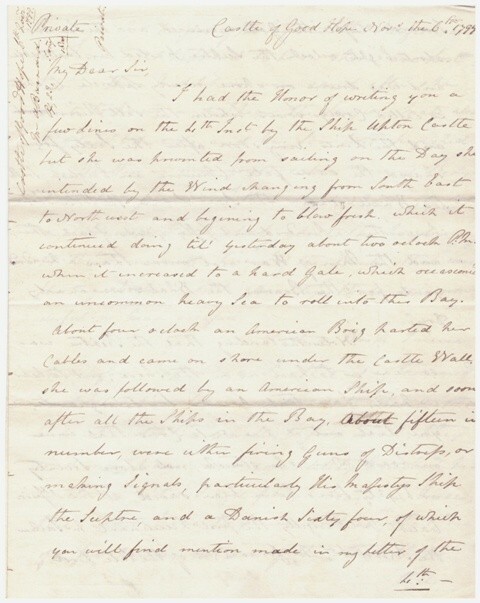 The next part of Barnard's letter refers to a request he had recently received from the Governor of Ceylon for wine to be supplied to that island from the Cape, as the Governor was of the opinion that all local wines were "unwholesome". Barnard is enthusiastic in his response to this, feeling that the Cape should not only look to England to sell its wine but also to the East. He then provides an interesting analysis of the effect of taxation levied by his Government and the demand for wine upon the farmers. The situation had seen an increase in brandy production instead of wine, resulting in a loss to the British Government of six Rix dollars per leaguer of brandy produced. Barnard also included a letter [see 5B] from one of the "Principle Merchants here, who has more the means in his power of supplying the wine, at a cheap and easy rate, than any person in the Colony" detailing the terms upon which such a deal could be concluded. (p. 4). In KAAPSE WYN & BRANDEWYN, Professor D.J. van Zyl provides a detailed account of the British attempts to regulate and control the wine industry post-1795 when they took control of the Cape. Just two days after that event, realising its importance for the Colony, they began implementing measures. As in other areas, they had not reckoned with the recalcitrance of the local population with regard to laws, edicts and taxes! Barnard reports upon the arrival of Sir George Yonge, the Governor replacing Lord Macartney, on board the Lancaster. Sir George spent his first night ashore in the abode of Mr John de Wet and the next morning was sworn in as Governor at the "Garden House, in the most Public manner" whereupon he repaired to Rondebosch to recover from the "fatigues" of the voyage. (page 7). Sir George brought with him good news concerning the progress of the conflict against Napoleon’s France by His Majesty’s Arms, which met with much satisfaction amongst both British and Dutch inhabitants at the Cape. In fact, Dutch burghers requested, and were given, permission to "illuminate their houses" in celebration. Further to this news, Barnard and the Fiscal composed a letter to the Governor of Batavia pointing out that it was time for him to "hoist his colours" and secure Batavia for the Stadholder, "His Prince". 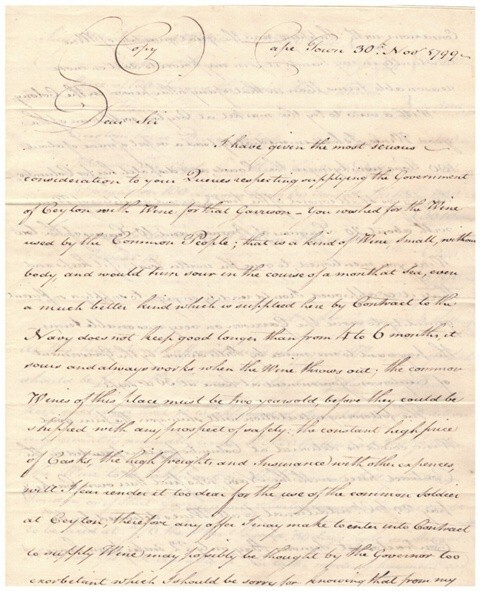 This letter would be taken to Batavia by an American ship then at anchor in Table Bay and in that way the letter would be delivered "into the Governor’s own hands". (page 9). There are faint traces of sealing wax on the verso of the last page of the letter. Letter 5B [4 pages]. 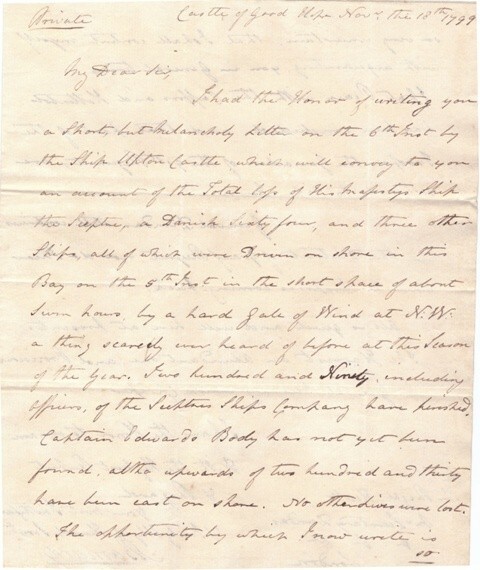 30 November 1799, Michael Hogan to A. Barnard Esq. The merchant Michael Hogan delivers a carefully reasoned reply to the request to supply wine to the Garrison of Ceylon. He points out that for wine to keep well, it needs to be matured for at least two years in casks. His vessel of 180 tons then anchored in Table Bay could leave soon with 20 leaguers of brandy and 10 leaguers of wine for delivery in Columbo, on terms for payment by the Government in 30 days. He then provides calculations and the suggestion that he could also send "very good wine" which would be "fit for the Governor’s table" too. (page 3). He also offered to take back any wine found unfit for consumption. Barnard reported upon the unexpected arrival at the Cape of Mr Neiderberg, the Governor of Batavia. His leaving at this crucial stage of the conflict between France and England, with Dutch forces ranged on both sides was, Barnard concluded, "unfortunate", although when he left Batavia, he had left the "Orange flag flying". Barnard, however, did not have much hope that his successor would prevail, as there was a considerable French garrison present. He was, he concluded, a "good and prudent man" but "not a very active one" (page 2). 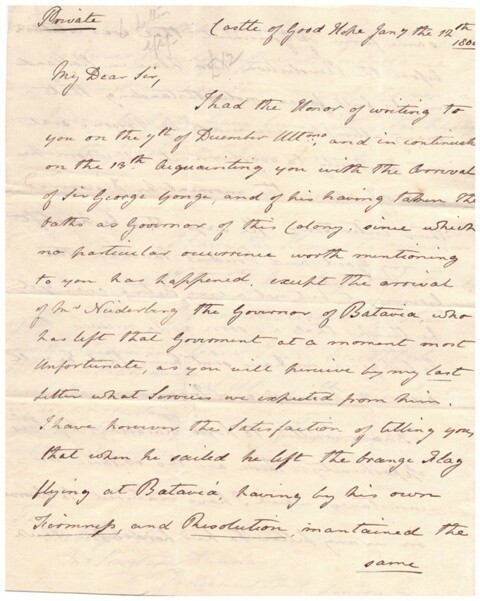 Barnard then finished the letter with a comment that he had written separately to Lord Macartney about "two or three circumstances" and these matters would be communicated to Dundas if Macartney deemed them of "sufficient importance". (p. 3). Barnard also indicates that he might have been "too hasty" in his judgement. Finally, Barnard adds a "PS" about wine that should have been delivered to Dundas and indicates he will write to his agent Mr Carstairs in this regard. It is possible that Barnard's interesting comment to Dundas prefaces what became an important issue. Sir George Yonge was to prove a disastrous Governor and after a short stay was recalled by Sir Henry Dundas who installed his nephew, General Francis Dundas, in his place. The recall was occasioned by reports reaching Henry Dundas of a "variety of abuses having taken place" under his watch. It is possible that Barnard, realising that a letter to Dundas would be an official one, chose to confide in his mentor Lord Macartney and to trust in his good sense to reveal what was required to Henry Dundas in due course.